To browse all the various pages and sections on this website, click the links on the right hand side bar. 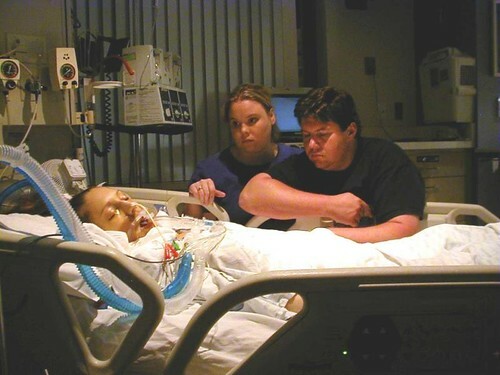 Christina Nichole on full life support at Sacred Heart Hospital Neuro ICU in Spokane WA in July 2004. Her older brother, Craig and his fiancée, Stacy are praying over her bed after doctors declared her brain-dead – globally brain-damaged, with NIL chance of recovery. Do you know of anyone who survived a Zyprexa Coma after being declared brain dead? I’ve heard of many who died, but so far none who survived except a few who were never declared globally brain damaged with NIL chance of recovery. I would love to hear from anyone who has been in or knows a person who was in, or is still in a Zyprexa coma of any kind. A short version is that Dr. Bender, the Head Neurologist on Christina Nichole’s coma case at Sacred Heart Hospital in Spokane WA, wrote that she was globally brain-damaged with NIL chance of recovery. His recommendation was to remove life support with no further tests needed. When Christina arrived at the local Okanogan Douglas County Hospital in Brewster WA her regular family doctor was on duty as the ER doctor (Dr. Keith Hanson). 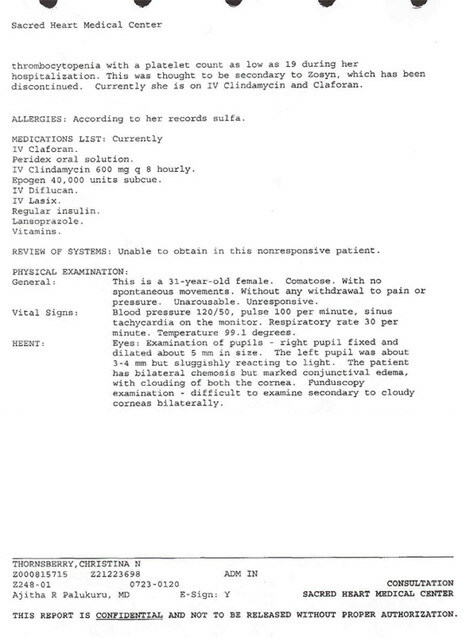 Her blood sugar level was -10 and she was a 3 on Glasgow Coma Scale. *Combined scores < 8 are typically regarded as coma. Adapted from Teasdale G, Jennett B: Assessment of coma and impaired consciousness. A practical scale. Lancet 2:81–84; 1974. Dr. Hanson did not expect to bring Christina to a conscious level again, but gave his 100% best and was thrilled and surprised that she began to respond. She was put in the hospital’s ICU unit overnight. The next day it was decided that due to her highest level on the Glascow Coma Scale only reaching 8, with signs of deterioration in her condition, she would be transferred to Sacred Heart Hospital Neuro ICU in Spokane WA. She was going to be flown by Emergency Helicopter, but for reasons that we do not know the plans changed to being transported by Ambulance for the 3 to 4 hour drive. Christina waved good-bye as they closed the ambulance doors to leave the Brewster hospital. During the trip Christina slipped from an 8 to a 3 on the Glasgow Coma Scale… again. A Sacred Heart doctor advised the ambulance crew to ‘use their own discretion’ as to whether to intubate her to put her on full life support. Fortunately the crew opted to do everything possible or it would have been over right then. 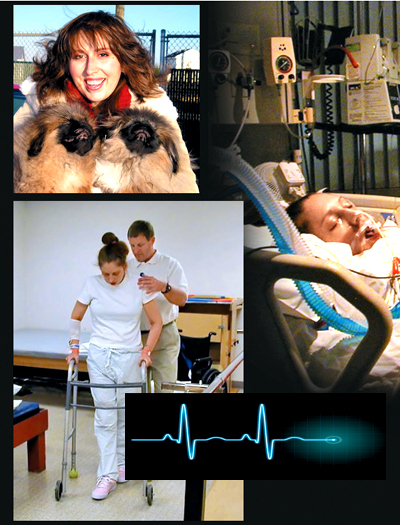 Christina stayed at 3 to 4 on the Glasgow Coma Scale for 3 weeks before she began to come out of her coma, very slowly. Even after another 3 weeks in Saint Luke’s Hospital in Spokane WA for rehabilitation, she was only at an 11 on discharge. It took a few more months of rehab as an outpatient in Central WA Hospital in Wenatchee WA before she reached a 13 to 14 level. I have never heard anyone rate her at a higher level than that since the coma, but I assume she is considered to be at a normal level now. I was in a coma and the doctors declared that I was brain-dead / globally brain-damaged. My mother and I have always had a silent connection that allows us to communicate without words and across distances. We do not understand how, but during my coma I was able to hear her and she was able to hear me. I was in and out of a locked-in coma state, where I could hear the doctors arguing with my parents and felt their painful tests each day, even though they were determined that I was ‘gone’ and unable to hear or feel anything. I often left my body and floated above it, looking down at myself and seeing everything in the ICU room, from the ceiling point of view. My mother was always able to call me back to my body and demanded that I not leave it again. She told me to look for God but not to go with Him. I talked with God. I was not in my body or room. It was beautiful, peaceful, and felt so good. God asked me if I wanted to go with Him. I told Him that I wanted to go back to love my mom and serve Him. God said I could go back. I did and then began a long, slow process to wake up from my coma. It was very difficult but Mom was always with me. I live with my parents at the ocean now. My mom had promised a trip to the Caribbean, which has always been my dream, as encouragement to recover. She could not afford the trip, so she and my father took me camping at the ocean and we stayed for a year. They then bought a house here and sold the house they had for 26 years in the desert part of the state. It’s my mom’s way of keeping her promise. I keep my promise to God everyday and serve Him in every way possible and love and treasure my parents. My near-death experience was the greatest blessing of my life even though I lost 20 years of memories, have short-term memory issues, and struggle with seizures and muscle problems. I am happier now than ever before, and forever thankful that God allowed me to come back. 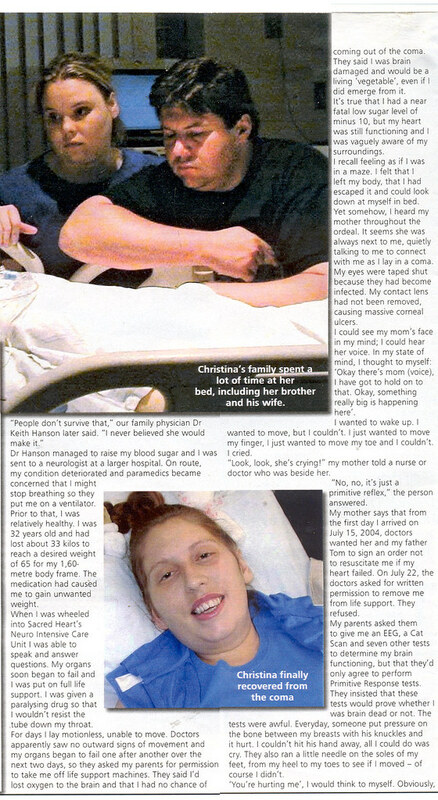 Christina’s coma story is published in ‘The National Enquirer’, April 13, 2009 issue, ‘The South Beach Bulletin’, April 16, 2009 issue, ‘Real People’ magazine in London England, #5-2009 issue, and ‘People’ magazine in South Africa, October 9, 2009 Vol. 23 #41 issue. A German magazine also contacted us for an interview, but we declined their request. Many people have contacted us for permission to use Christina’s story in their lines of work and studies, and many people have shared their coma stories with us. 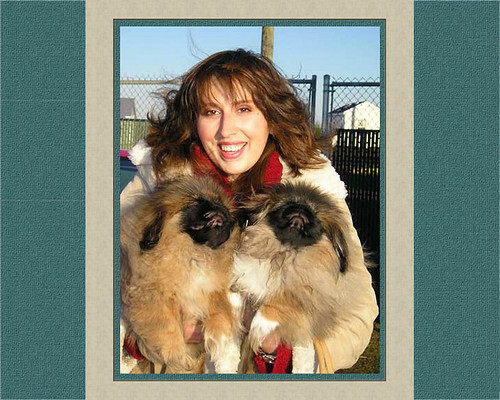 We invite anyone who would like to write us about Christina’s coma experience to contact us via my email address at WA_Peekaboo_Pekingese_ShihTzu@comcast.net . We are open to future magazines, books, etc. if done well, to share this survival event with anyone who may be interested. to view the magazine online preview. A mother’s love brings daughter ‘back from the dead’ before docs plunder organs! Christina Nichole lay paralyzed, hooked to life support in the intensive care unit of a hospital while doctors hovered over her bed. Although she appeared to be in a coma, she could hear every word they said – and their conversation terrified her. They were talking about harvesting her organs for transplant! They said she was brain-dead – no chance she’d ever recover. But they didn’t realize that although she couldn’t move or speak Christina was still very much alive. “I’m here, I’m here! Don’t cut me open — don’t hurt me! Let me wake up!” she heard herself screaming inside her head. Doctors may have given up on Christina – but her mother refused to. Christina’s incredible ordeal began when she went into an apparent coma after her blood sugar crashed because of medication she was taking. 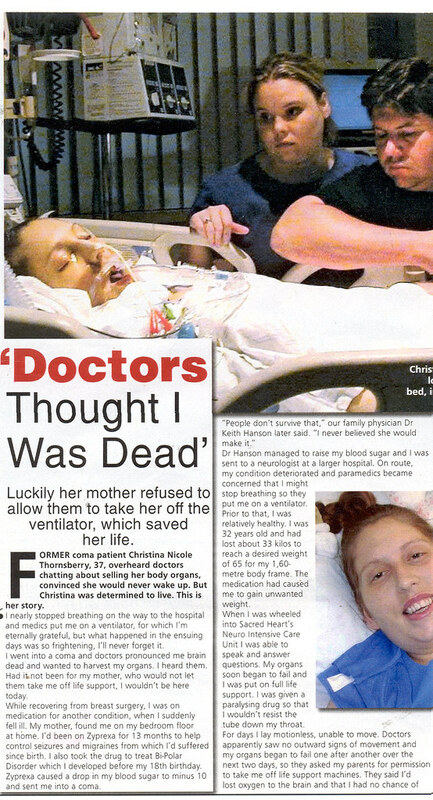 Just six days later, doctors asked her parents for permission to harvest Christina’s organs. “They insisted she was gone, that she had irreversible brain damage,” recalled Judy. Click here to read The National Inquirer’s two page story. After the new window opens click on your Zoom tool to enlarge the words for easy reading. Click here to read the local newspaper’s half page article. After the new window opens click on your Zoom tool to enlarge the words for easy reading. Click here to read “People” South Africa magazine’s two page story spread. After the new window opens click on your Zoom tool to enlarge the words for easy reading. The following excerpt is an interview with Dr. Hanson and ‘The National Inquirer’. The published version did not include this part. Family physician Dr Keith Hanson looked after Christina before the coma and after. And he’s seen the hospital records. “They gave up on her.” he told this writer. “Neurologists suggested they withdraw life support. Her organs had failed, then recovered and were viable. “They were convinced she was brain-dead, otherwise they wouldn’t have suggested taking her off life support. “She was as close to death as it’s possible to be, but Christina defied medical science. “And sometimes we should just hold our hands up and say thanks to God for a miracle, because I think that’s what happened here. Since my daughter, Christina Nichole, came out of her coma in 2004, we have worked everyday on her recovery therapies. As time allows I am building a new website named “Coma Diaries” where Christina and I will print the diaries we have kept from before she went into her coma, during her coma, and every day since her coma. We will invite other coma survivors or the families of coma victims to write their coma diaries and stories on our site. Until then, please visit the three photo albums below of her coma experience at the hospitals in Spokane, WA. Christina Nichole went into a one-time onset of hypoglycemia (-10) and a coma after ingesting a prescription named Zyprexa for 13 months. This type of coma is called a Zyprexa coma. For Christina it was also a partial ‘Locked In’ coma, because she could hear and was aware of being paralyzed in her body. The first album chronicles Christina Nichole’s coma state from the first to the last day at Sacred Heart Hospital in Spokane WA. 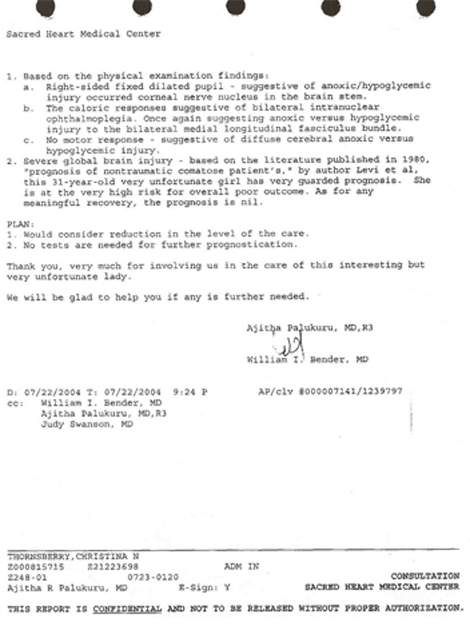 She was declared brain-dead / globally brain-damaged, with NIL chance of recovery in July 2004. The Neurologists did not perform adequate and customary tests, such as Harborview doctors said they would do routinely in cases like this. They did primitive Reflex tests that gave opposite results than the same tests performed by her father, who is a Doctor of Chiropractic. Cat Scans, MRIs, and EEGs done independently after our return home showed normal brain activity with no signs of brain damage. Her memory loss, seizures, and muscular problems are a result of being in the coma. Tests like that do not lie. However, doctors do… at least in this case. How could she be completely brain-dead except for a spotty portion of her brain stem that kept her heart beating, and have completely normal test results? How could so many doctors and specialists be 100% wrong? They can’t. So what was their agenda? It was clear that they wanted to kill her and harvest whatever they could from her body because they harassed us for 10 days to sign papers to allow them to do that. Why did they want her dead? Government insurance? Body parts on the market? We want answers and no one wants to answer the questions. In the second album, after Christina began to come back from her coma state she was transferred to St. Luke’s Rehabilitation Hospital where she learned to swallow, eat, talk, walk, read, write, solve puzzles, make salad, shower and groom herself. She lost over 20 years of memory, so she only had vague memories of her life after 12 years old and was quite amazed to see that her body had matured as she had no memories of that happening! Christina has not regained her lost long-term memory, and has daily short-term memory loss problems. Her muscles were weakened from the coma and her lungs and other organs still cause difficulties in her everyday life, apparently as a result of the traumas they went through during the first days of her coma. We also have questions that the medication Zyprexa causes these problems since she stopped taking it. Apparently people have had problems like this after stopping Zyprexa. She has frequent daily seizures that Dr. Wilensky at Harborview Hospital in Seattle WA says are four different types of epileptic seizures. One seems to be panic episodes that she cannot control when she is ill or stressed in any way. She has seizures that cause her brain to swell which give her tremendous headache pain. Her blood levels of sodium are usually off and she becomes dehydrated when this happens, requiring emergency room care. She is usually taken by ambulance to the nearest ER when this happens. Her local Neurologist, Dr. Miller, and her family primary care physician, Dr. Jackson, work with Dr. Wilensky at Harborview in Seattle to take care of Christina. She recently had another in-hospital brain study of 5 days to determine the cause of her current Grand Mall seizures and the damages they may be causing her brain. It was her third study like that through Dr. Wilensky. After being released from Harborview on new seizure medication she had severe reactions, nearly continuous seizures, brain swelling, headache, sodium level drop, and dehydration from vomiting and being able to hold down food or liquids. She went 4 times in one week, per her 3 doctor’s orders. On the 3/11/2010 ER visit the doctor ignored Harborview’s request to contact them and arrange flying her to Seattle if needed. This clueless, cruel doctor Gray’s Harbor Community Hospital in Aberdeen WA failed to diagnose, take tests, provide fluids, and withheld any treatment while accusing her of being ‘a drug seeker’. It was insane. Christina was not there by choice but because Harborview’s Epileptic Center nurse said that if Christina did not go to the ER willingly within 10 minutes she would call an ambulance to pick her up. A police officer was called to remove Christina from her bed because she could not understand or respond due to her seizures making it impossible for her do anything with her body at the time. Read the whole story about the violent wounds that Aberdeen WA policeman delivered to Christina through abuse and criminal police brutality as two nurses stood at the end of her bed and watched without offering her help or assistance from his assaults on her body at Medical Malpractice and Police Brutality On 3/11/10 on this website. Christina did not do anything to provoke the abuse, and was unable to resist due to being incapacitated from her seizures. Believe me, the hospital and police department will be hearing from my attorney very soon! How dare them!! We have already read their fake records for that night. 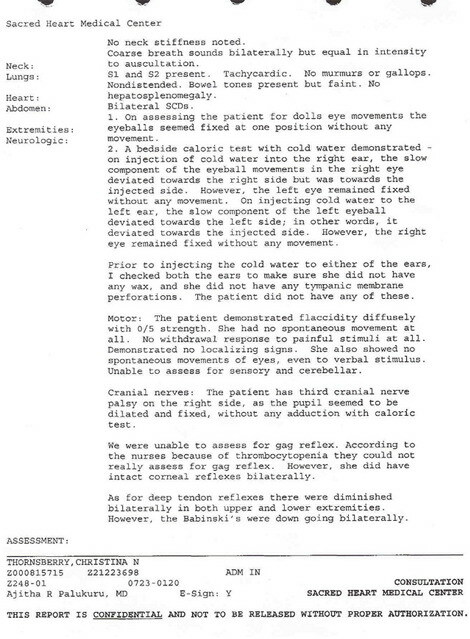 Dr. Miller (her local Neurologist) read them to us a few days later and not a single word was correct. Dr. Miller knew this because he knows Christina, he was looking at her injuries, and the ER report said that they had called him and Dr. Wilensky. He said, “Well, they certainly didn’t call me and I know they didn’t call Dr. Wilensky because he has staff who were expecting their call and they never received it.” Shame, shame, shame on all those so-called medical people and the policeman involved. I simply cannot believe Eli Lilly, Zyprexa, the doctors who said she was brain-dead from her coma, and now this! What is going on in our world? This is the US… not a 3rd world country where people have no rights and can be murdered for just about any reason or no reson at all. We are supposed to have protected rights here. Otherwise, what is the point of living in the US and paying our taxes to support these people, institutions, and authorities who are paid to protect and care for us when we need assistance? Doctors who want to kill patients for organs and lie about brain-death, drug companies who produce deadly medications without warning us, and policemen who abuse helpless patients! Fortunately he didn’t tazzer her! He must feel like such a big man, beating up a little woman having seizures and thinking like a 12 year old child… terrified and in pain that he caused her. Where are the good people when you need them? Clearly they are not at Eli Lilly, Sacred Heart Hospital in Spokane WA, or Gray’s Harbor Community Hospital in Aberdeen WA. Christina has frequent nightmares of her time in the coma and developed post traumatic stress syndrome from her memories of the doctors wanting to harvest her organs when she was alive and hearing them talk about it. She stays close to me day and night because she often feels unsafe and needs my presence to keep her reassured that she is all right and that no one is ever going to harm her or harvest her organs while she is still alive and aware. To the average person this would seem like a silly fear, but to Christina it is an all too true reality. “The Victory Visit” – Christina Visiting Sacred Heart Hospital in Spokane WA After Release From St. Luke’s Rehabilitation Hospital. The first photo in this third album shows Christina standing next to the chairs and conference table, where Mom and Dad argued with specialists, doctors, nurses, and clergyman that they were not in control… God is. If God wanted to take Christina He would, and if He didn’t we were certainly not going to sign papers to give permission to allow them to kill her. They continually insisted that she was globally brain-damaged but had taken Cat Scan tests without telling us about it, and we found out two years later in copies of medical reports that those tests came back NORMAL. We tried to get all the medical reports ourselves but finally had to hire attorneys to obtain the copies because the hospital refused to send more than a few pages to us or doctor’s offices that requested copies. The hospital sent most of the pages to our attorneys but left some out that we remember reading during Christina’s coma. We had to pay the hospital nearly $2000.00 for the copies that they sent to our attorneys. During Christina’s Victory Visit on this day the nurses welcomed her with open arms, but the specialists and doctors scattered like running rats and would not talk with us and have never talked with us even though I have called and emailed asking for communications. Christina seemed to be born with mood swing problems. She could be wired and awake for three days and nights at a time, literally wearing me out in the process. Then she would instantly switch gears and sleep for the next three days and nights. I fed and changed her while she slept through everything. If she was in a bad mood, nothing we did could put a smile on her face. If she was in a good mood, nothing that happened brought her down from her excited state. In her late teen years this translated into bizarre behaviors that I could never understand. She made poor choices, did not keep herself safe, hibernated in her room, or disappeared on unexpected excursions. After five years of college we knew that something was terribly wrong. She was brilliant and breezed through school and college classes until she started making so many poor choices that her education was disrupted and her life was in danger by people who would harm her. We brought her home from college two different times to attempt to help her. It wasn’t until the 2nd action of bringing her home that we were able to find appropriate medical attention. Previously doctors simply assumed that she was a ‘bad’ girl, and never believed me when I told them that she was not simply a bad girl. She had no reason to misbehave, which went against her nature, upbringing, and her personal values and beliefs. I’m sure most parents of kids who are not little angels their whole life feel that way too, but I never lost hope and continued to run interference in her life to keep her as safe as possible while we searched for explanations. Eventually she was diagnosed with Bi-Polar Disorder and started on medications, which ended with Zyprexa the day she went into her coma. Before her diagnosis the doctors had treated her for depression, not realizing that Bi-Polars are prone to suicidal thoughts and attempts when put on depression medication. Each time they put Christina on a new depression medication she responded by trying to attempt suicide. It was too devastating to put into words, and she had several very close calls. Fortunately, her weapon of choice was taking all the pills she could get her hands on at the time, so through the close observation that our family kept on her we managed to get her to the hospital each time, soon enough that the doctors were able to save her life. When she was not on antidepressants she did not have suicidal thoughts and made no attempts to commit suicide. She could never understand how she could possibly think that way, let alone try to do it, because it was so completely against her nature when she was not on antidepressants. After her diagnosis the doctors stopped prescribing antidepressants and she stopped having problems with suicidal thoughts or attempts. Treating her Bi-Polar Disorder was not easy, however. She was put on one medication after another trying to find the right one for her, only to find that the dosage or drug had to be changed as the months passed. During each failure of a medication and finding another to take its place she suffered greatly with her uncontrollable mood swings between mania and depression. Of all the medications they worked with Zyprexa proved to be the best for controlling the Bi-Polar Disorder without side effects that she could not tolerate. We thought we had found the magic bullet! Little did any of us know that the manufacturers of Zyprexa, Eli Lilly, had become well versed on the fatal flaws associated with Zyprexa, including hypo and hyper glycemia… blood sugar control problems. For over a year after being aware of the situation they failed to notify the public or prescribing doctors. Patients developed Diabetes, experienced drops in blood sugars, or other extremely dangerous health problems. Blood sugars that go too high or too low can cause comas and death. All of this was happening and still Eli Lilly kept their dirty little secret about their highest selling billions of dollars making drug, Zyprexa. The 13th month of Christina’s taking Zyprexa, and three months after Eli Lilly made the problem public, we remained uninformed about it. 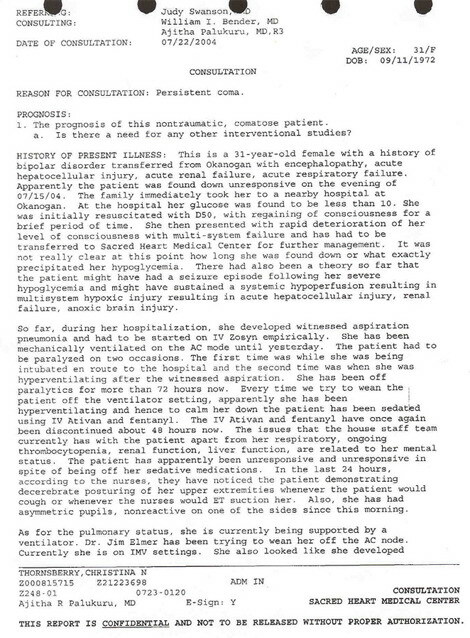 Her prescribing doctor apparently did not hear or read about it and did not make the connection to the danger that Christina was in at that time. Even at the time that her blood sugar dropped to -10 (3), putting her into a ‘Zyprexa coma’, the doctors on her case were either unaware of the connection or ignored it. We were never told that Zyprexa caused her coma. We finally saw an ad on television talking about Zyprexa lawsuits in the summer of 2005, one year after her coma, and put it together ourselves. Her case is still waiting to go to trial in New York City after we initially turned down the original settlement offer from Eli Lilly’s attorneys. Thankfully Christina did not need to take any medications for Bi-Polar after her coma and we see no signs of the disorder. So she is safe from further problems for medications given to Bi-Polar patients. It is unbelievable to us that Zyprexa continues to be the most profitable, highly prescribed medication for Eli Lilly. They were only required to write a warning on the label, and settle lawsuits with damaged patients or their next of kin. 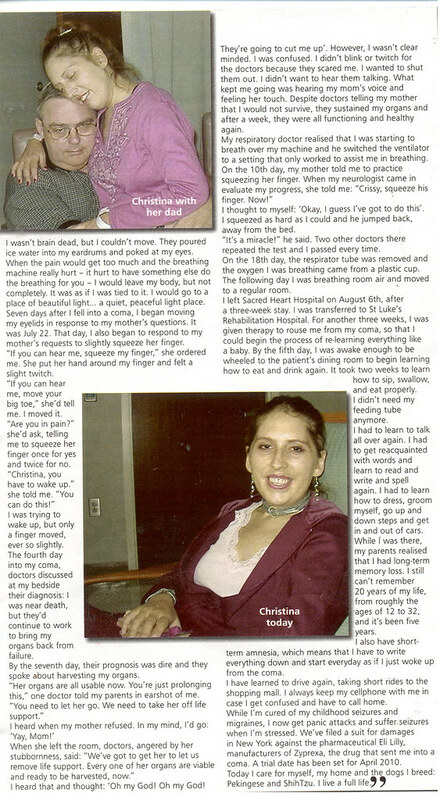 I do not know, but Christina may be the only surviving Zyprexa coma patient. She would be dead too if we had listened to the doctors insisting that she was brain-dead and signed papers to allow euthanization. Praise God for her determination to come back! She is my hero because she has survived so many nightmares in her short life, and she has overcome every one of them, glowing with God’s light through each and every day. Thank you for reading. Judy – Christina Nichole’s thankful mom. Along with nourishment for my body, I received nourishment for my soul every time I walked past that sign. I needed it far more than I needed food. There were many other types of notes from God during Christina’s coma. I always found them when I least expected them and needed them most. I knew that we were never alone. God was holding our hands every moment of the way. God was carrying us when we were too exhausted to walk. God was comforting us to keep our hearts, minds, and emotions at peace… while we waited patiently to see what He would do. Even though the doctors, machines, and intensive care were desperately needed and perfectly provided, we knew that He, not the doctors, machines, and care, was in control. If He took her, that was His decision. But we would not take that decision out of His hands by signing papers to have our daughter euthanized. 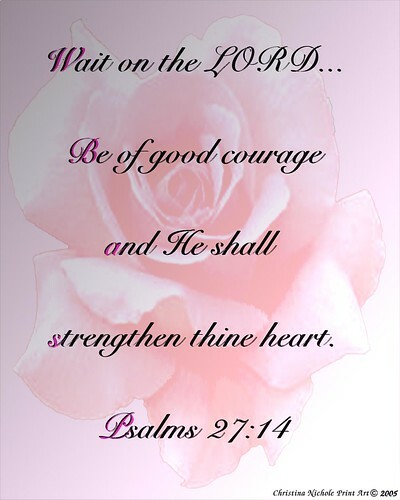 God was definitely in control… all we had to do was wait and be of good courage. Click here to view just one of many websites describing Zyprexa Comas and other medical complications caused by this medication. We are concerned that government supported insurances could sky-rocket the practice of euthanasia that has already been in place and in action for many years into catastrophic proportions and numbers. Doctor encouraged suicide, withdrawal, and denial of life support could easily become the normal standard when an average citizen falls too ill or too old and begins to use medical resources supported by tax paying citizens. Any Health Plan would most likely never specifically state these directives, but could make the laws already in place more user-friendly, thus promoting early death among health-care givers, patients, and family members. We believe that every citizen of our country deserves the best care possible, when needed, regardless of station in life, illness status, or age. We also believe that patients have a God-given right to life and should not be forced to die, in any way encouraged to commit suicide, or have life-support withdrawn due to doctors, insurance’s, or family member’s opinions. If, however, a patient decides on their own that they have a right to hurry their imminent death along through medically assisted suicide, we would never presume to judge their decisions. Christina is currently working on writing her first book about her coma experience. The title is tentively set as “Memories Of Mist”. As her mother I am currently working on my first book about my experiences throughout Christina’s coma. My book’s title is tentively set as “Coma Diaries”. We plan to work together on multiple books together. “Memories of Mist” and “Coma Diaries” will present the coma experience as something we both remember clearly from our own perspectives of the patient in the bed who was being declared brain dead even though each of us knew that she was still here and able to communicate with me, and me with her. It is a miracle and God is alive to save us from anything. Thank you, Michael. I completely agree. Good blog! I truly love how it is easy on my eyes and well written. I have subscribed to your RSS feed! Have a great day! Very nice post I enjoy your website! Carry on writing the good articles! I don’t generally respond to content but I will in this case. Seriously, a big thumbs up for this one! Thank you fo rsharing your story. It truly means a lot to me. My father is currently in a coma due to a respitary arrest followed by a cardiac arrest. Today is day 11 and for the past week I’ve been told by the dostors that he will never wake and overcome the amount of brain damage. Today because of your story I have a bigger and greater faith. I will hold on and pray to God and have faith in God that he will do what’s best. I Will Wait. Thank you Christina. Christina is so beautiful! Not only on the outside, which is completely obvious, but also on the inside. She literally glows!! Very nice and wonderful story! Praise God that the doctors were not allowed to euthanise Christina Nichole. What a terrible loss that would have been. Look at her now! I just read your story in the National Enquirer and just wanted to say one thing. You are a great Mother!!! Hello Carla. Thank you so much for writing! I appreciate your thoughts and prayers for Christina as she continues to deal with the aspects of her coma. I enjoyed your message that you have been there and encouragement to hang in there. You too! You have overcome as much or more than Christina… especially since you have children. Christina cannot even imagine having a child to be responsible for. She cannot have children, has never been married, and doesn’t want to date since her coma. The pets and print art that she creates on the computer keep her busy and improving everyday. Computer work is extremely challenging for her everytime she sits down to work on it. Way to go kiddo. I have been there my self, in a coma. My kids were told I was brain dead and it was best to unplug me. Thank the good lord and the faith of my children, sisters and my mother I am still here. I have been out of my wheel chair completely for a year now. It was a very hard road to learn to walk, talk, and even potty train again but I made it and so will you just keep trying. I will pray for progress daily for you. I went into a coma because of a really bad infection in NOV of 2003. I am a mother of 4, a grandmother of 13 and since Sept 27 of this year a grea grand mother of 2. Hang im there kiddo the best is yet to come, God loves you and you have some thing important to do here. I am so sorry to hear about your daughter. I am glad to hear that you all didn’t give up on her! You guys are special parents not giving up on her and for being there for her. I believe things happen for a reason even though we don’t understand why. I can feel your pain because we have an autistic son that is 20 years old now and we have to fight for him all the time. The doctors were very negative about him when he was a little boy and I had to fight to put him into a public school but I didn’t give up! He couldn’t talk at first and on top of his autism he had ADHD. To this day, our autistic son can talk and he has eye contact and he has high functioning autism. I am very thankful I didn’t listen to those doctors and teachers here in Oregon. You guys were blessed with a loving beautiful daughter! I am very touched about your story! God be with you all and never give up on anything that you believe in. We raise shih tzus and persian cats to help our autistic son. I think God for animals!!! I would really love to have one of your puppies. They are beautiful! As is your daughter. I read the bio on your web page and it is a miricle what your family has to endured. I think what you do is fantastic. I would love to adopt one of your puppies. please send me some info on what little baby is still available. I live in Oregon but I wouldn’t mind the drive. Thank you and God Bless.